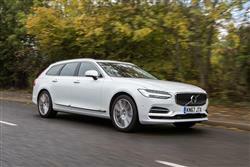 Volvo's V90 is a large luxury estate every bit as good as anything the German brands can bring you. 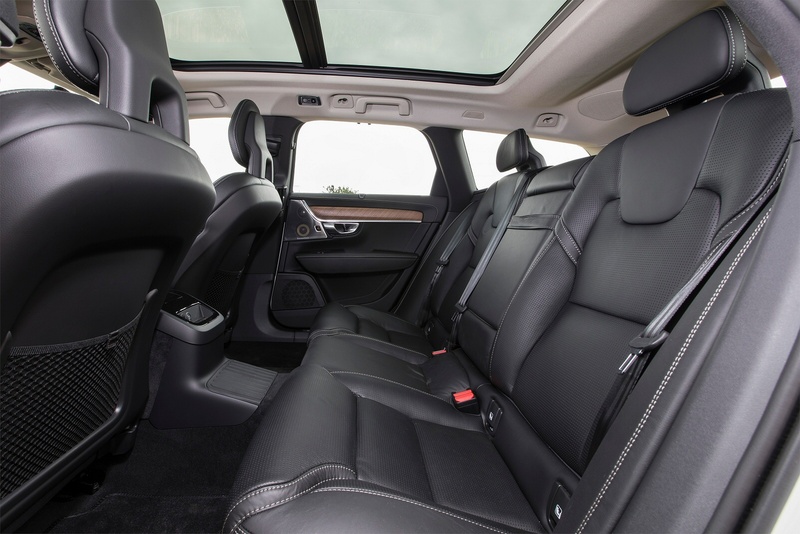 It's the most sophisticated station wagon we've seen from the brand for a couple of decades, efficient, spacious and stylish. If you're shopping in this segment, you need to consider it. 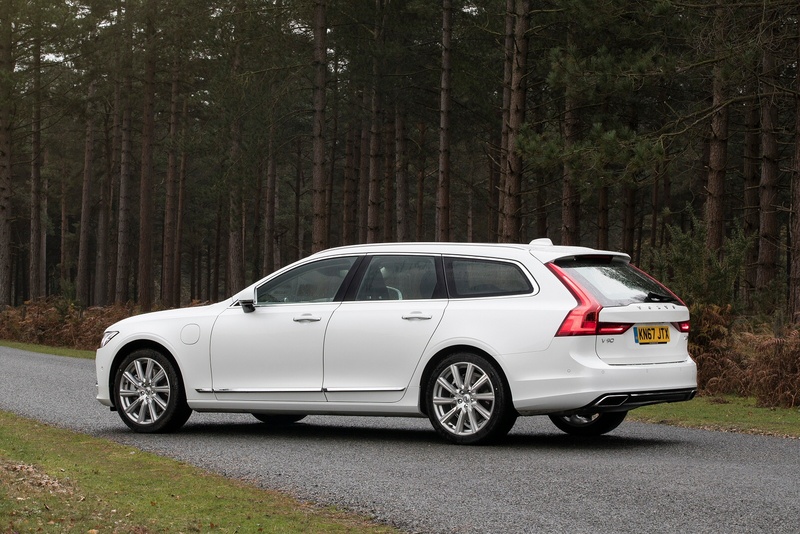 There's nothing quite like a big, boxy Volvo estate car: it's the kind of product that defines this Swedish marque. Nor is it the kind of car this Scandinavian brand is going to leave behind as it redefines its product range under rejuvenated Chinese ownership. For proof of that, check out this car, the V90. 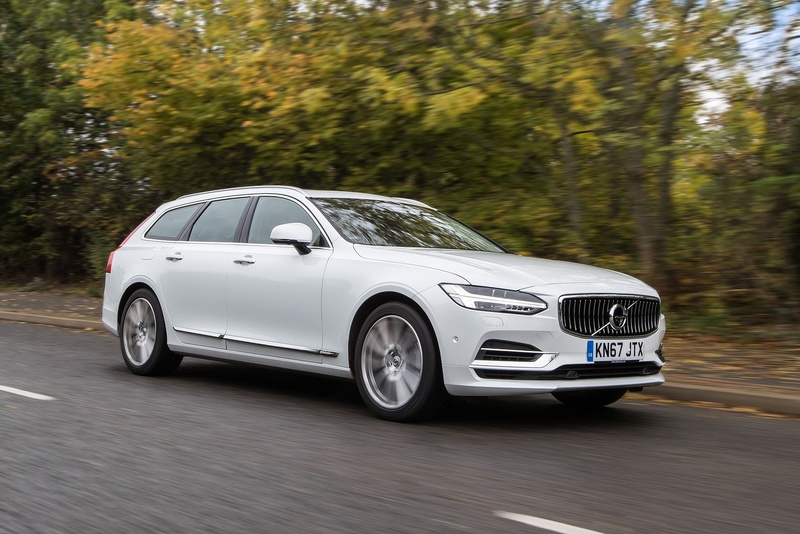 This is the station wagon version of the S90 saloon, a car based on the same sophisticated architecture as the company's award-winning XC90 luxury SUV. 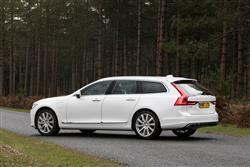 It's a size larger than the existing V70 model - and a good deal more sophisticated under the skin. Plus, as you'd want, it remains as Swedish as meatballs and as practical as ever. The prospects then, are promising. 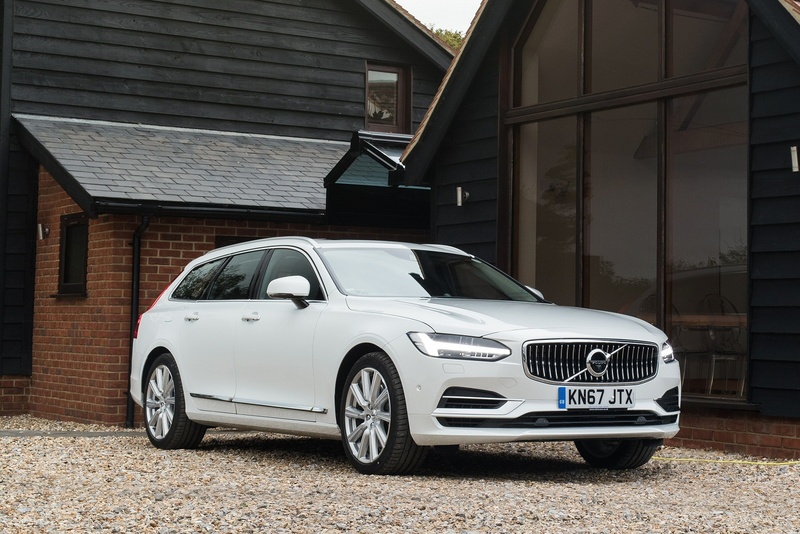 Unlike older V70 models, this V90's more sophisticated underpinnings can accommodate a complete range of the brand's 'Drive-E' engines, 2.0-litre units that are impressively efficient. 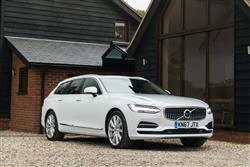 Mainstream buyers are being offered the choice between two units: either the 190PS D4 powerplant borrowed from Volvo's smaller S60 and V60 models. Or the 235PS D5 twin turbodiesel, also with four cylinders, this matched with the security of AWD. All V90s come with smooth 8-speed auto transmission. Go for the Cross Country bodystyle and you can have AWD with either engine. The 235bhp D5 variant utilises an innovative technology called PowerPulse to boost responsiveness. This uses compressed air, which is stored in a tank in the engine bay and refilled automatically, to spool up the turbo at low revs. This helps to overcome turbo lag, which is the short delay in the power delivery you experience in traditional turbocharged engines. With both diesel engines, there's also the option of 'Cross Country'-spec models that have AWD, a 65mm higher ride height and a wider track. At the top of the range sits the T8 Twin Engine petrol/electric plug-in hybrid model. This delivers a combined 412PS output, with a thumping 640Nm of torque. 62mph from rest is dispatched in under 6s. 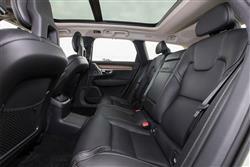 There's also the option of a four cylinder petrol-powered 2.0-litre T6 variant which puts out a potent 320PS. Plus there are also more conventional four cylinder petrol turbo units, a T4 with 190bhp and a T5 with 250bhp. 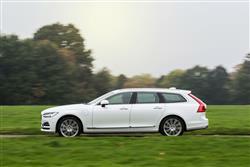 This is certainly a more credible full-sized executive estate than anything Volvo has brought us to date. The V90 has a proud yet non-aggressive face, characterised by a concave grille - apparently a homage to the Volvo P1800 - that's home to the brand's distinctive 'Iron Mark' logo. The T-shaped 'Thor's Hammer' lights are recognisable from the XC90 and deliver a powerful sense of direction that makes this car unmistakable on the road. 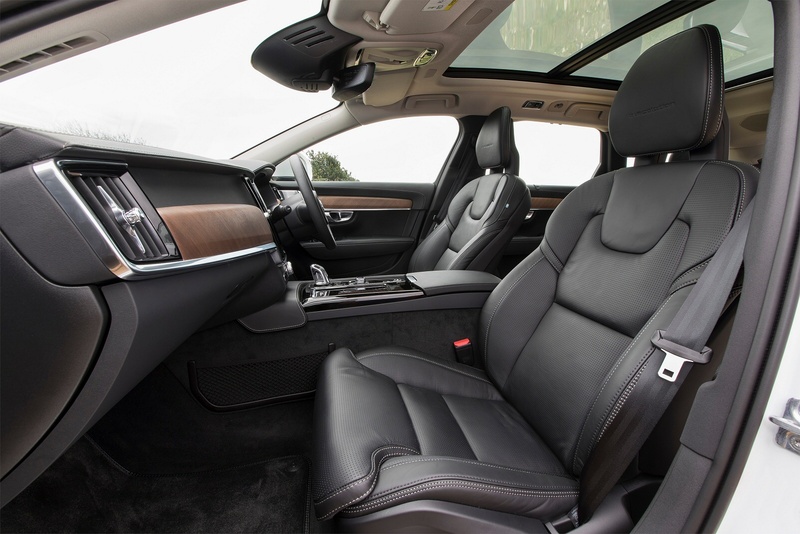 Inside, you'll find basically the same interior as the S90, with beautiful finishing and plenty of leather, classy wood and glass. 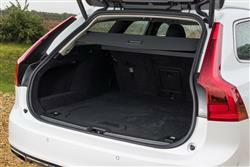 At the rear, there's up 1526-litres of bootspace (including underfloor storage). That's a useful figure, though is a little bit less than you'd get with rival BMW 5 Series Touring and Mercedes E-Class estate competitors. That's probably down to the stylish sloping rear glass. 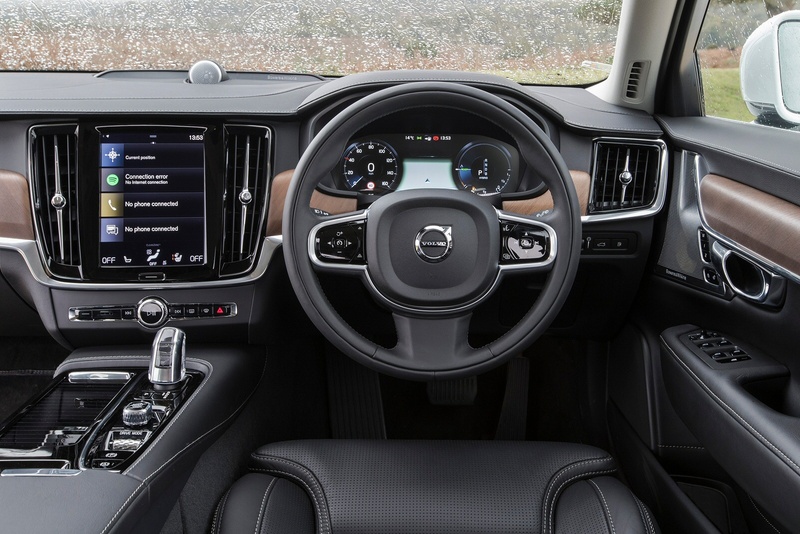 As with the XC90 luxury SUV, the dash features a massive tablet-like touch screen that plays a key role in creating an interior that is modern, spacious and uncluttered. Volvo's clearly put a lot of budget into driving up materials quality and this V90 gets soft leather and wood with handcrafted details, including diamond-cut controls for the start/stop button and volume control. Prices start at around £38,000 for the entry-level D4 diesel and T4 petrol models. 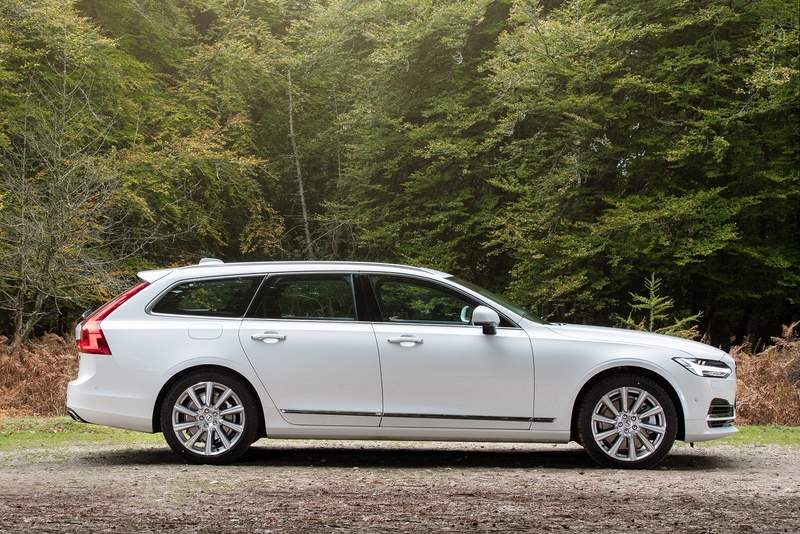 That represents a premium of £2,000 over the S90 saloon variant. Figures elsewhere in the range swell up towards the £50,000 mark, as you'd expect from a car in this class aiming to go up alongside full-sized executive segment rivals like BMW's 5 Series Touring, Audi's A6 Avant and Mercedes latest E-Class Estate. There's also the option of 'Cross Country'-spec models that have AWD, a 65mm higher ride height and a wider track. Top models can be ordered with features like 21-inch alloy wheels and powered, heated and ventilated seats trimmed in Nappa leather. Inside, the tablet-like touch screen in the centre console drives the minor controls and a whole host of Internet-based products and services. Audio services in the plushest variants come courtesy of a monster Bowers & Wilkins stereo. The electronically controlled air suspension has a choice of five modes, including one where the driver is free to tailor the settings to his or her personal taste. V90 safety gear includes a run off-road protection package which tightens seatbelts and activates energy-absorbing technology in the seats when the car detects challenging terrain ahead. Another system is the auto-braking feature, which cuts in if a driver pulls out in front of on coming traffic. Plus the V90 also introduces a world-first - large animal detection - a system capable of detecting large animals such as elk, horses or moose, night or day. All these safety systems aim to bring Volvo closer to its vision of nobody being seriously injured or killed in any of its vehicles by 2020. 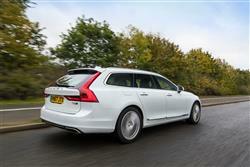 With the D5 diesel most V90 buyers will choose, expect 57.6mpg on the combined cycle and 129g/km of CO2. These figures improve to 62.8mpg and 119g/km in the less powerful D4 diesel variant. The efficiency champion is the top T8 Twin Engine petrol plug-in hybrid model, which should deliver under 50g/km of CO2 and up to 26 miles of pure electric driving range. Depreciation will be a key consideration for potential owners. 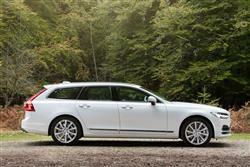 It'll be interesting to see to how the market responds to Volvo's new direction in style and quality here. Think in terms of RVs that are comparable with a brand like Lexus in this segment and you shouldn't be too far out. If you�re looking for a new Volvo V90 2.0 D5 PowerPulse Inscription 5dr AWD Geartronic Diesel Estate for sale, you�ve come to the right place. At Bristol Street Motors we don�t just have the best Volvo V90 2.0 D5 PowerPulse Inscription 5dr AWD Geartronic Diesel Estate deals, we also offer friendly advice and help with all your enquiries to ensure your buying experience is a happy experience.